This is part of an initial collection of photographs from a Saturday afternoon on Ingersoll Ave. A lunch time hangout – the Manhattan Deli is part of a unique collection of diversity that can be found along this street. A “mom and pop” ambiance – with terrific picture windows. This is the sort of business along this street that embraces the sidewalk and the street – as opposed to the fast food chain businesses. It’s the sort of place you want to become yours and sit and read a paper. There is a delicate balance between new development along this street and redevelopment of existing businesses. This collection is intended to show over time how the community treats these opportunities. 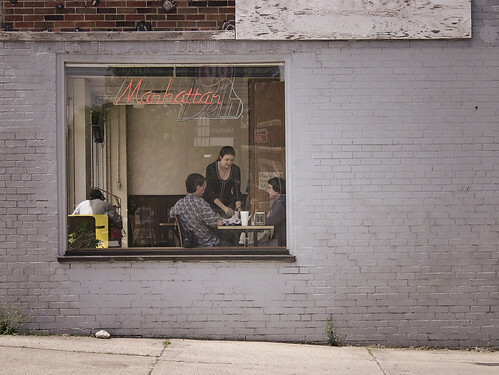 This entry was posted in Documentary, Matt Niebuhr - Photography, Photography and tagged Deli, Des Moines, Iowa, Manhattan by Matt Niebuhr - West Branch Studio. Bookmark the permalink.